When your wallet becomes overflowing with credit and store cards you don’t use, it is a challenge just getting to the ones you need when you need them. You may find it frustrating to sift through everything in your wallet to get to what you were looking for. 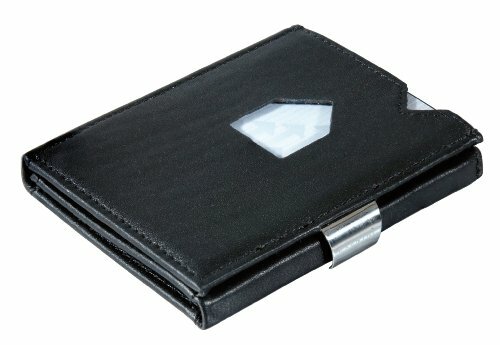 Exentri Trifold wallets allow you to easily access your most frequently used cards while keeping valuables secure. Have you found your current wallet has become full of useless info and you fancy an upgrade? With what could be the best minimalist wallet for men, an Exentri Trifold might be a great option for you. These wallets reduce the fuss of having to flick through all your cards to get to one that you need. They do still have the capacity to carry plenty cards and cash, and they are slim compared to traditional styles. The advantage is they don’t look bulky and obvious in your pocket. Trifold wallets are ideal if you carry many cards you use frequently but don’t carry a significant amount of cash. However, if you don’t carry as much plastic and like the idea of something simple, we recommend considering a men’s money clip wallet as an alternative. Before you purchase a minimalist wallet, take a look at men’s designer wallets – you should consider if they’re practical for your needs, as you don’t want to sacrifice substance for style. Consider what wallet would compliment your fashion sense, and your lifestyle. Consider how much you can afford to spend. Although a wallet is still an essential, the emphasis on style is emerging greater than before. Exentri Trifold wallets offer you stylish, quality made minimalist wallets that are practical and efficient. Competing with brands like Trayvax and Bellroy, Exentri are striving to be a leader in the market, making the best slim wallets for men in 2018. The Exentri trifold grants you access to some of your most used cards without opening it, while keeping other items secure and organized. Ideal for those of us who like structure and simplicity, this isn’t the right choice for someone who requires space to stuffing in business cards and receipts regularly. The finish of the leather is smooth and sleek, and it looks and feels solid and luxurious. The Exentri Trifold comes presented in a smart gift box. The Exentri Trifold wallet is traditional and classic in appearance, but innovative in design. Merging sophistication and practicality, beautifully. Although built like an ordinary trifold, the Exentri has been designed to offer you access to some of your most frequent cards without opening the wallet. Open fully, the clever construction allows easy access of up to 12 cards without looking overcomplicated. In addition, there is a large discrete space for bills through the center of the wallet, folding them neatly. This space can also be used for storing notes or receipts. There is a handy slot for travel tickets, parking, and cinema stubs, in the center section. The wallet closes over securely with a custom stainless steel clasp. The design of this Trifold is sharp, it looks sleek, stylish, and is a very sophisticated accessory. Real, quality leather is used in the construction of the wallet. It has a firm structure, but is soft and luxurious to the touch. The wallet is flexible and pliable, comfortable to carry in jean pockets. The colors available are rich and sophisticated, and each exudes style, class, and individuality. The lining is a soft nylon with integrated RFID blocking technology. The stainless steel clasp is custom made and feels sturdy and secure when the wallet is closed. The stitching is concise, detailed, and well crafted. Overall, the materials used make the wallet appear luxurious and made of high quality. 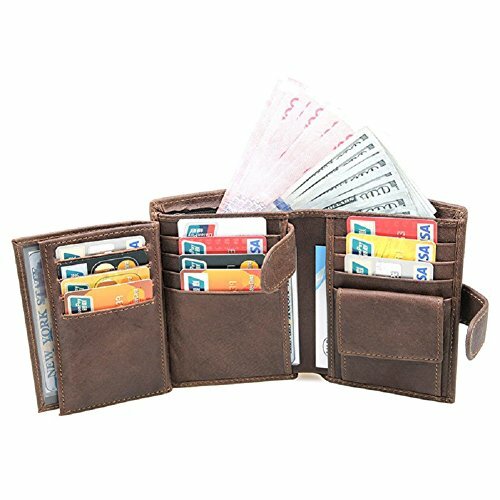 GENUINE LEATHER: Each Wallet Is Made Out Of A Premium Grade Genuine Cow Hide Leather Lined With Nylon Giving You A Smooth Textured High-Quality Wallet One That Will Last You For Years To Come. 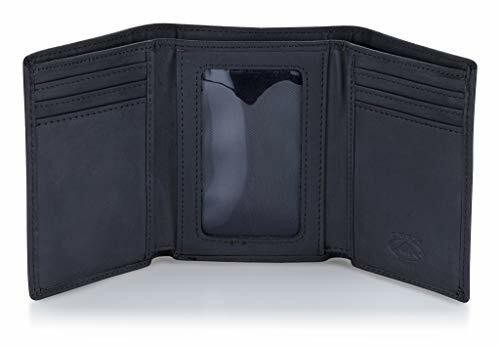 RFID BLOCKING: Our Slim Wallets Come With RFID Protection Ensuring All Your Money/Information Is Safe From Anyone Trying To Swipe Them Using The RFID Chip In Your Cards. QUICK ACCESS: Every One Of Our Minimal Wallets Comes With Two Quick Access Windows Allowing You To Have Quick Access To Your Two Most Used Cards. Simply Swipe Up On The Cards & You Have Instant Access All Without Opening Up Your Wallet. SLIM DESIGN: The Trifold Design Is What Keeps Our Wallets So Slim Even With 10+ Cards. It Is Perfect For All The Minimalist Lovers Out There Looking For A Light Skinny Wallet. SECURE: Every Wallet Has A Stainless Steel Locking Clip Which Allows You To Secure Your Wallet Easily. This Ensures Nothing Can Fall Out Of The Wallet When Transporting It, Keeping All Your Cards & Money Locking Safely Your Wallet Wher It Belongs. The practicality of the Exentri Trifold works on a number of levels. As a slimline, minimalist product, the tightly closed wallet with offer you access to at least two of your most regularly used cards. The cut-out design means you can identify which card you need, and snide it out easily by your thumb. The Exentri also works well as a traditional trifold. However, due to the precise cuts of the leather, and the firm clasp, it remains more compact. As you unfold the Exentri, there are four more credit card slots with easy access. Each slot is designed to fit two cards (although will fit more comfortably), so there is excellent capacity by today’s standards. A small slip on the middle section is ideal for placing temporary items safely, like parking slips, or theater tickets. Ideal for the modern man. If you do tend to carry cash, there is a discrete pocket that slips in between your cards, so you’ll never be short of a few bucks to tip. Overall, this is a very practical wallet, that is sure to have you covered for all occasions. P.S. Wallet phone cases can never provide this much practicality. TriHOLD is a compact trifold wallet is very similar to the Exentri trifold. Three sections allow for quick access to as many as 12 cards, as well as a center section for cash, and a small slot for tickets. Constructed from real leather, with a nylon lining, and stainless steel clasp. A cheaper alternative to the Exentri, but could be a good option if you’re on a tighter budget. The Artmi trifold is a cheaper alternative to the Exentri Trifold, with many similar features. A soft leather trifold that compacts into a compact slimline wallet when folded over. There is seven quick access card slots, two ID card slots with windows, a center space for cash, and other additional pockets. This could be a great trifold wallet for you if you’re looking for a more traditional travel document wallet. Again, a more affordable wallet than the Exentri, the Stealth Mode Trifold shares many features, but is not as sharp when folded closed. The leather is soft and smooth to the touch, and looks luxurious. The wallet has 11 card slots, three slots with windows for photo ID, plus space to store cash. 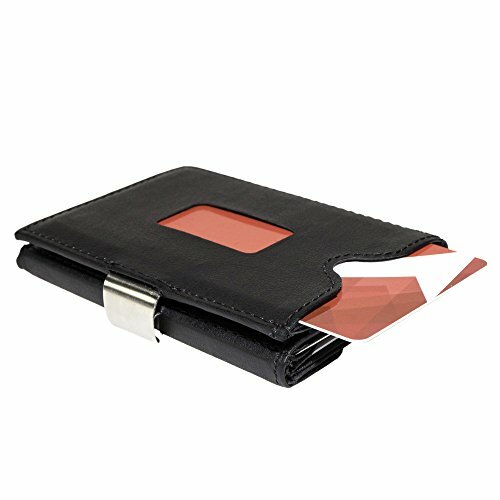 This wallet has modern RFID shielding, but is more traditional in appearance, so consider one of the alternatives if you prefer a slimmer silhouette. The Exentri Trifold wallet is reasonably priced for a men’s designer wallet. It might not have the big brand name, but it is packed with features and looks the part. Quality materials, workmanship, and innovative design combine to create a stylish and eloquent accessory. With plenty of capacity for cards, cash, and more, plus the added advantage of quick access slots mean this could be ideal for the man on the move. The slimline design works well when closed over, and the custom made clasp locks the wallet over securely. If you’re looking for a slimline wallet that works looks sleek and stylish, works well with any attire, this could be ideal for you. RFID shielding means your privacy is protected, and the timeless looks mean this wallet is future proof. If the Exentri Trifold sounds like the best wallet for you, come check it out here .